Above Photograph: Ernie, 10, doing a 'demo' in weight pulling at Honey harbor Winterfest, hosted by Spiritrun Alaskan Malamutes. Working Alaskan Malamutes is a figurative term, because just about all of them are 'pets' - including mine! Dog scootering and weight pull are my two main competitive working events. Scootering and sometimes sledding are daily activities mostly for fun, but some races, the rest of the year. Snow or dirt pulls are the only two types my dogs have done though there are also 'rail weight pulls' and weight pulls on natural surfaces such as carpet, cement, floors, etc. Snow is absolutely the most difficult for the dogs, followed by dirt, followed by unnatural surfaces and with rails the dogs can generally go past 10,000 pounds! Rail pulls simply mean the cart is on a little rail track and can be moved easier. Carpet and cement are generally have less resistance while the 'sledge' used in snow pulls can get caught, frozen. Normally the dogs pull about 1/3 less for each type - IE if they can do 2000 pounds on carpet, it will be around 12 on dirt and 800 on snow. Some dogs prefer one type over the other though, too. Most hate wet mud for dirt pulls and don't like their paws sliding. Claws are very, very important to the safety of the dog, and ability to pull, in either dirt or snow. Without them their feet slide in the soft, wet dirt or slip on the icy snow. 'Show trimmed' nails are not conducive to pulling adequately in snow, ice or dirt but fairly harmless on carpet. Most known weight pull records are around 5000 pounds on dirt, around 3000 on snow and more than 5000 on carpet. Combined, my purebred dogs range range in age from nine to two years and have around 15 titles that include conformation, temperament tests, working wins and certifications from Ontario, Canada. My dogs - aka the Furry Dollies - have almost 50 gold, silver and bronze wins in sledding, scootering and weightpull competitions. Weight pull competitions are a lot of fun and excellent for training! But they also live as pets. As a quality breeder, I would expect the same care for any registered Alaskan Malamute puppy for sale that I produce; quality pets, going to quality pet homes and who would live as my pet Malamutes. Many great books are available to train your puppy. At Ontario Dog Sports there are quite a few pictures of Bert and Ernie at a snow pull, I assume as the examples for the sport as I was never asked about the pictures. During the years, my Alaskan Malamutes have won or placed in many working events, competing mainly in Ontario, Canada - and have nearly 50 wins to show for their effort. For the most part, I've kept a record of each of my dogs wins. The picture at the top is Ernie, giving an weight pull demonstration the weekend he turned nine years old. Gold (and 2nd highest pull) Mush Larose Snow Pull Feb 2011 - one day after his ninth birthday! The next thing on the agenda will likely be to put 'excursion' titles - WTD, WPD, WLD - on all of my dogs 2011 as I think they have done enough, and done well enough, in competition to be able to do some excursions. The dogs can earn the certificates if I take them out on fun runs. 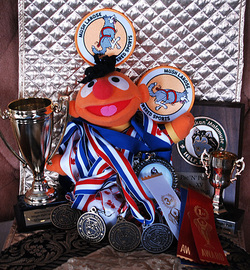 Ernie's 'stand-in' with his medals, trophies and ribbons from working events. 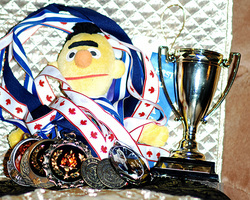 Bert's 'stand-in' with his medals, trophies and ribbons for working wins.